Relates to activities in which people spend time talking to each other or doing enjoyable things. Today when we think of the word "social" it's followed by "media". But that's not what this article is about. Instead, it's about being social in the traditional sense: spending time with like-minded people, face-to-face, and forming relationships. With travel writing, you can be more productive and ultimately more profitable when you get out there and meet people who can help you sell more stories. That means sharing ideas with other writers and giving each other support and inspiration. It means finding places where you can meet editors to find out what kind of stories they want, and how you can help them. It means meeting DMO reps who can host you on trips you can write about. Students at 2016 Seattle Travel Writing and Marketing Master Class learning about how to find magazines to pitch their story ideas. Back in 2007, when I made the decision to be a freelance writer, I attended a travel writing workshop. I didn’t know if this workshop would help me. I worried about how much it cost (around $1200). But here’s what happened: I soaked up lots of good, practical information that gave me a basic foundation of what the industry was all about. Within a couple months after the workshop I started pitching story ideas to editors, and had more than a dozen articles accepted for publication. The rest is history. It turned out the workshop was worth every penny I paid, and then some! It literally reshaped my life and helped me learn the ropes, faster than if I had tried figuring it out myself. Since then I’ve learned a lot, developed some of my own techniques, and have more than 1,000 articles published in 200+ magazines, trade journals, custom publications, in-flights, on-boards, newspapers, and online websites. Had I not taken that first workshop to introduce me to the basics, I have no doubt my results would have been disappointing. I probably would have dropped out of freelance writing within a few months from frustration and not knowing how to sell my stories and get them published. Learning the travel writing process on your own is very difficult. It’s a hit or miss approach and most people aren’t able to find success with a do-it-yourself method. Tasks like coming up with a marketable travel story idea requires knowledge of the industry and what editors want. Articulating this idea to magazine editors successfully is loaded with pitfalls. Writing a publishable article is an additional hurdle where many people fail – if they actually get that far. 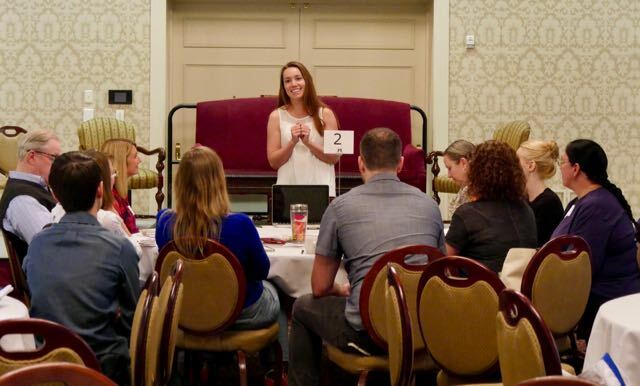 Taking a class or workshop will help you learn the ropes of this business. You’ll learn how to earn more money far more quickly and easily than if you try figuring it out on your own. If you’re struggling to get published, look for a writing workshop near you – or go farther afield and take an intensive course designed to get you up to speed quickly. Do you need to improve your writing skills? There are lots of basic creative writing courses and many are only as far as the nearest community college. Or, do you need to learn how to sell your articles and figure out who will buy them? Workshops that teach marketing skills to writers are much more difficult to find. Do you want to know how to get invited on press trips? For many travel writers, getting these travel perks is the ultimate goal. I only know of one class that will give you enough inside information to know how to do these things. That’s why I developed a complete workshop for travel writers. It focuses on marketing skills and learning how to secure those coveted press trips. It also covers travel writing techniques and photography tips important to travel writers. I only teach it once a year in the U.S. You can learn more about it here. If you’re unable to travel, there are also online travel writing workshops. My Online Master Class includes everything the Live participants get - except you only pay half the price and don't have travel expenses. CVB Rep talks with travel writers at breakout session at Travel & Words Conference, 2016, in Walla Walla, WA. Once or twice a year you should consider attending a writer’s conference. Every conference is different, so look for conferences that offer the most benefits for your stage of development. At some conferences, I’ve met up with Convention & Visitor’s Bureau media representatives, to organize press trips to their cities. Meeting the tourist reps helps you to learn about the attractions they have to offer and decide which ones match up with your outlets. One example of a good conference is Travel and Words, a conference held each year somewhere in the Pacific Northwest. DMOs from around the northwest attend and you have plenty of opportunities to interact with them. You’ll also meet editors and lots of other travel writers. Some writer’s conferences match writers up with magazine editors. Writers hobnob socially with the editors. And at some conferences you get a 10-minute story pitch across the table, speed-dating style. Meeting editors in person is a great way to score lucrative and long-term relationships and earn more for your stories. There’s nothing like meeting an editor face-to-face to cement a good working relationship. Study the conference program in close detail before signing up. If there’s no agenda, don’t sign up until you see one. Some writer’s conferences are so general that they are of no practical use to freelance travel writers. Make sure the agenda lists topics and speakers that are interesting to you. Talk with fellow writers about worthwhile conferences they’ve attended. I made the mistake, once, of not listening to advice from another writer, and ended up wasting a lot of money on a conference that was full of fluff. Don’t make this mistake! Do your research, and make sure the agenda looks exciting to you. Get reviews and listen to feedback from other writers. Some conferences cater primarily to aspiring novelists, versus travel writers. Be certain there’s some value for you to make it worthwhile. Conferences can be expensive. Read the fine print before you sign up for any conference so you don't waste your hard-earned money. Be sure that you understand the cancellation policies and that the organization is reputable. Life happens. Can you get your all or some of your money back if you need to cancel due to an unexpected emergency at home? I got ripped off once by a so-called travel journalist’s association when I had a medical emergency. Instead of charging a cancellation fee as promised in the fine print, they kept all my money. 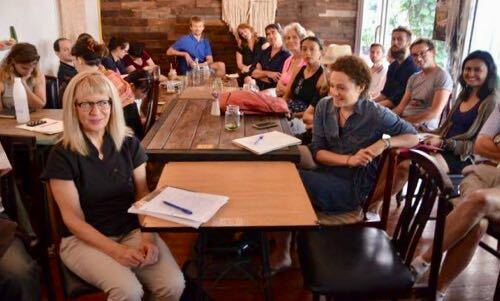 Chiang Mai Writers Group listens to speaker giving presentation about travel writing in 2016. Every writer’s group is different. Look around your city and find one that suits you. Many writer’s groups are aimed at novelists. This won’t help you much as a travel writer. 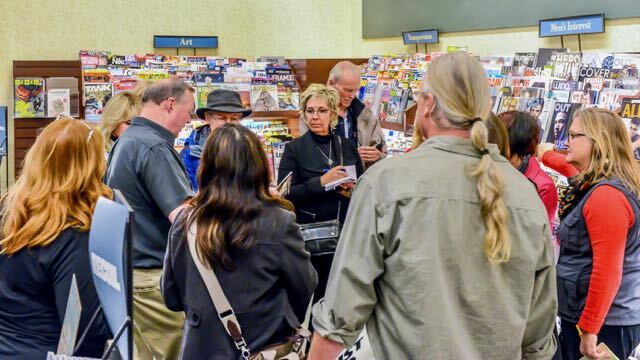 Look for a group with a broad mix of writers so you can enhance your knowledge, or look for one specifically aimed at travel writers. When I lived in Chiang Mai, Thailand I joined a general writer’s group. Every two weeks they hosted a presentation by one of their writers, covering topics from writing book and short stories to getting it published. It included topics like being productive and staying motivated as a freelancer. These presentations were invaluable. They made a huge difference in how I viewed my business and my approach to writing. Another good thing about writer’s groups is that you gain inspiration and ideas live and in person. You’ll learn different ways people earn more money writing and you’ll learn actionable ideas to help with your own writing. You’ll also find that a local group provides a social outlet. Writers tend to stay cooped up at home, and work alone. A writer’s group gives you some colleagues to help boost your writing game and help you make some new friends in freelancing. If you can’t find a writer’s group that interests you, start one of your own. Use Meetup to “find your people” or link up with another organization that can help you get the word out. For example, when we were in Thailand we belonged to the Chiang Mai Expats Group. They had a long list of special interest groups and we were encouraged to start one of our own if we didn’t find what we were looking for on their current list. Their role was to provide a platform for finding other people interested in the same thing. So the bottom line is to decide what you need to get started or to up your travel writing game. Is it a class, a conference or a writer’s group? In my opinion, every freelance travel writer needs all of these things. Plan these social events into your calendar each year, and you’ll find yourself more inspired, more productive and doing more with your travel writing than you ever expected. Now get out there in the writing game and get social the good old-fashioned way!